When I came up with an idea for a scary Halloween costume, I wanted it to be completely original. 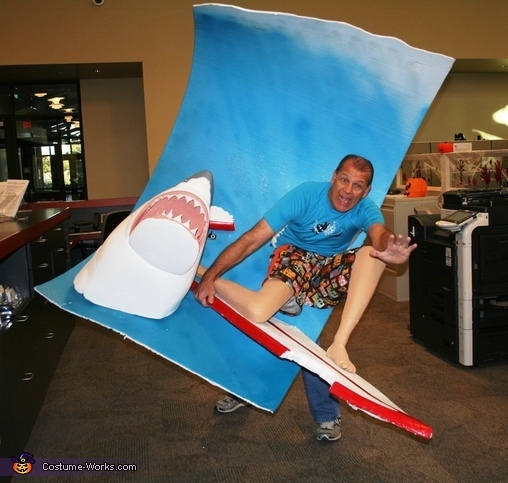 I thought about the scary things we could experience and a shark attack seemed like a good idea for a costume. For me, it is more fun to show a scene that describes a scary situation, then to just to dress up like a scary character. I prefer suspense to gore, so the surfer is intact but what comes next is up to your imagination. In addition to the visual impact of a "walking wave", I included an audio clip, with my mp3 and a portable speaker playing a dueling medley of the theme to "Jaws" and "Surf'in USA" by the Beach Boys. The speaker was well concealed in the costume. To add a little believability, the shark's lower jaw has a motion activated motorized hinge that closes when someone comes close. I did win first place and a cash prize.